Upon the death of Julian II, in battle near Phrygia against the Persians around June 26, 363, the position of ruling the Roman Empire suddenly became available. The armies offered to elevate Saturninus Secundus Salutius, a praetorian prefect, but he declined because of his age. 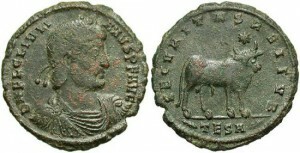 Next in line was Flavius Jovianus, the militarily accomplished son of General Varronianus. Jovian accepted and shortly thereafter signed an unfavorable treaty of peace with the Sassanian King, Shapur II, to get the beleaguered and starving Roman army back into friendly territory. This retreat cost the Romans all of their territory east of the Tigris River, part of Armenia, and the cities of Nisibis and Singara in Mesopotamia – all territories won under Septimius Severus and Galerius. Julian II is often referred to as Julian the Apostate, because of his attempt to return paganism to the empire. One of the things Julian did was issue an edict to religious freedom on February 4, 362, which was a way to demote Christianity and give him a way to confiscate wealth and power from those in the church. When Jovian ascended to the throne, and returned to Antioch, on October 22, 363, he reinstituted anti-pagan laws abolished by Julian. 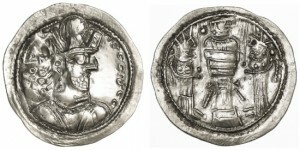 Numismatically interesting, Julian issued the large “maiorina” or “AE1” coin, which features a large bull on the reverse, and sometimes a portrait wearing a beard of various lengths on the obverse. This was a clear break from the traditions established under Constantinian rule of generalized iconography, and harkened back to the paganistic times of promoting accurate portraiture with personal reverse themes. The actual meaning of the bull on the reverse is still not certain, but is often referred to as an Apis bull, possibly in connection with an Apis bull statue uncovered in Egypt in 362 and delivered to the emperor in Antioch. Another hypothesis is that it represents Julian’s birth sign of Taurus. Quite possibly, it simply represents Julian’s leadership position, but the two stars on the reverse keep the entire subject open to discussion. 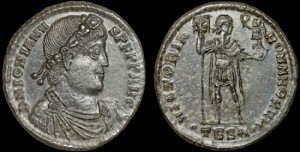 Jovian not only restored Christianity as the state religion, he returned the coinage back to the standard set by Constantine by utilizing an idealized, clean-shaven portrait and a military-based theme or the simple vota in wreath for the reverse. Julian II. A.D. 360-363. Æ maiorina. Thessalonica. VF, dark green patina with red-brown deposits. Shapur II AR Drachm, Lustrous Good Extremely Fine, 309 – 379 C.E.